Artur Nikolayevich Chilingarov (Russian: Артур Николаевич Чилингаров; born 25 September 1939) is an Armenian-Russian polar explorer. 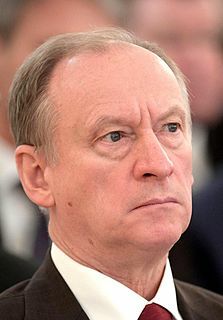 He is a corresponding member of the Russian Academy of Sciences, he was awarded the title of Hero of the Soviet Union in 1986 and the title of Hero of the Russian Federation in 2008. He is the president of State Polar Academy. Chilingarov is a member of the United Russia party; he was a member of the State Duma from 1993 to 2011 and is the current representative of Tula Oblast in the Federation Council. He was born in Leningrad to Russian mother and Armenian father. His father was born in Gyumri (Leninakan) and moved to Vladikavkaz at a young age. In 1963, he graduated from the Arctic faculty of the S.O. Makarov Leningrad Maritime Institute. As an engineer-oceanographer, he was directed to the Tiksi observatory of the Arctic and Antarctic Research Institute. In 1965, he was elected first secretary of the Bulun Komsomol district committee. In 1969, he was appointed head of the drift ice station “North Pole-19” and, in 1971, Chilingarov headed the Bellingshausen Station of the 17th Soviet Antarctic Expedition. Between 1974 and 1979, he worked in the Western sector of the Arctic as head of the Amderma Administration of hydrometeorology and environmental control. Under his direction, new forms of Arctic operative navigation support were implemented; for the first time, experimental work on cargo transfers to fast ice during wintertime were carried out in the Yamal Peninsula. Chilingarov summarized his experience in navigation support on the Northern Sea Route in his dissertation for the scientific degree of a kandidat of geographical sciences. In 1985, he headed the special expedition on the research vessel Mikhail Somov, which was ice-blocked in the Southern Ocean. For successful performance of the rescue operations in extreme conditions and for displayed organizational abilities and courage, Chilingarov was awarded the title of Hero of the Soviet Union on February 14, 1986. In January 2002, he led an expedition to the South Pole along with 14 other tourists on an Antonov An-3 biplane. When a mechanical problem grounded the aircraft at the South Pole, Chilingarov and other VIPs were flown by American Hercules LC130 aircraft to McMurdo and then onward to Christchurch. The rest of the group arranged a pick-up from Adventure Network International, who operate tourist flights to the South Pole. In January 2007, he led a helicopter expedition to Antarctica, he was joined by FSB chief Nikolay Patrushev and visited the South Pole and Amundsen-Scott station. During the 2007 Russian North Pole expedition, Chilingarov, accompanied by five other explorers from different countries, descended on 2 Mir submersibles to the seabed 13,980 feet below the North Pole in order to plant the Russian flag there and gather specimens of the seabed. In regard to the territorial claims in the Arctic, Chilingarov was quoted as saying, "The Arctic is Russian. We must prove the North Pole is an extension of the Russian landmass". In July 2008, Russia announced it was sending Mir submersibles to descend one mile to the bottom of Lake Baikal to conduct geological and biological tests on its unique ecosystem. Chilingarov is scheduled to join in 60 dives in total. On July 29, 2008, Chilingarov took part in a dive to a depth of 1,580 meters in Lake Baikal, just short of the record 1,637 meters. On January 10, 2008, Chilingarov was awarded the title of Hero of the Russian Federation for "courage and heroism displayed in extreme conditions and for the successful completion of the High-Latitude Arctic Deep-Water Expedition." In August 2009, he revealed a planned Arctic expedition for April 2010. Chilingarov plans to fly on dirigible AU-30, manufactured by the Aeronautic Centre Avgur. Chilingarov is the author of more than 50 scientific publications. He was elected into all the State Dumas and served as Deputy Chairman of the Third State Duma. Wikimedia Commons has media related to Artur Chilingarov. ^ "Armenians of the World-Arthur Chilingarov" (in Armenian). Shant TV. 12 November 2011. Retrieved 23 March 2014. ^ "Artur Nikolayevich Chilingarov" (in Russian). Warheroes.ru. Retrieved 19 November 2014. ^ "RUSSIAN VIP SOUTH POLE VISIT 2002". Newzeal.com. Retrieved 19 November 2014. ^ "Patrushev lands at the South Pole during Antarctic expedition". Interfax.ru. Archived from the original on February 8, 2012. Retrieved 19 November 2014. ^ "Russia ahead in Arctic 'gold rush'". BBC News. 2007-08-01. Archived from the original on 3 April 2010. Retrieved 2010-04-25. ^ Reuters (2008-07-29). "Russia sub's deep lake dive fails to set record". Reuters.com. Retrieved 2008-07-29. ^ Президент России Указ «О награждении государственными наградами Российской Федерации» (in Russian). Kremlin.ru. Archived from the original on 18 January 2008. Retrieved 19 November 2014. ^ Чилингаров собрался в Арктику на дирижабле (in Russian). Fontanka.ru. 2009-08-21. Retrieved 2009-08-21. ^ "Adoption Ban Passes Unanimously". Themoscowtimes.com. Retrieved 19 November 2014. Hero of the Russian Federation is the highest honorary title of the Russian Federation. The title comes with a Gold Star medal, an insignia of honor that identifies recipients. Mikhail Babushkin was a Soviet polar aviator and a Hero of the Soviet Union. 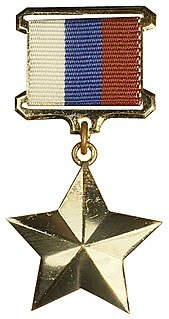 The Order "For Naval Merit" is a state decoration of the Russian Federation bestowed for excellence in military or economic maritime endeavours. It was established on February 27, 2002 by Decree of the President of the Russian Federation № 245. Its statute was amended by presidential decree № 1099 of September 7, 2010.